Poor Hattie Peck simply loves eggs, but she has only ever laid one egg—and it never hatched. Eggs are all she thinks about, all she dreams about. No egg is too big; no egg is too small. So if she can’t lay another egg, she’s going to have to go out into the world to find one. Hattie embarks on a journey in search of all the abandoned eggs. She dives to the deepest depths of vast oceans. She soars over gigantic cities and climbs up mountains towering above the clouds. Through gloomy dark caves, deep below the ground, Hattie searches. And she doesn’t find just one egg. There are so many abandoned eggs, just waiting for her to find them! With her newly gathered eggs in tow, Hattie Peck returns home. Sitting on so many eggs at once is quite the task, but Hattie doesn’t mind. Days and weeks pass, until one day, finally, there’s a Crack! Scratch! Tap! But what will happen when all those eggs hatch together? 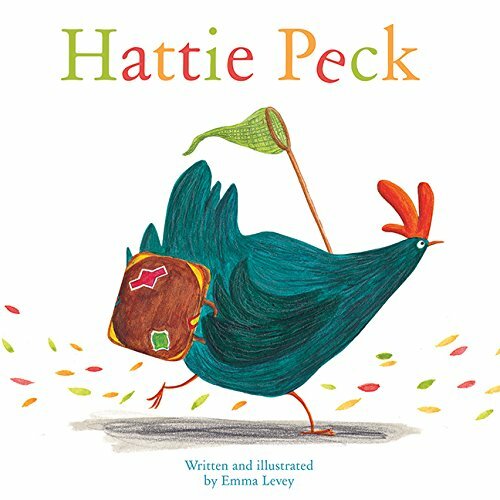 A hardcover book appropriate for preschoolers, Hattie Peck tells of a chicken who has an obsession for eggs. She decides to embark on a journey and gather all the eggs she finds. She goes underwater and above buildings, in the search for eggs. In the end, she's got quite the collection. As it turns out, Hattie Peck has gathered the eggs of several animal species. This charming story doesn't take long to read but it's still engaging. It can open up conversation about going on adventures and about what animals are born from eggs. One person will win a hardcover book copy of Hattie Peck. Yes I do like eggs...and the best come from friends who keep their own hens. I do like to eat eggs once a week as a vegetable scramble. Yes I do like eggs; one of my favorite things to eat with eggs is sasuage casserole! Yummy! We love eggs! I like them scrambled on a sandwich. We love eggs fried, scrambled and hard boiled! yes. we have 7 chickens and eat eggs daily. I really love eggs and we try to eat them every day. I do like to eat eggs. Sometimes--I have to really be in the mood for them though. I'm neutral on them. I'm not crazy about plain old eggs, but I like them in quiches, baked goods, etc. My toddler would love this book. She wakes me up at the first crack of dawn to go to collect the eggs. We like to eat eggs here. I didn't used to like eggs but I do now! No eggs for me. My daugher loves eggs though! Yes, We like our eggs! I love eggs! My favorite are scrambled, but I also love hard-boiled, egg salad, deviled eggs & egg-drop soup! I love to eat eggs, but I have eaten so many in the past months that I am a little bored with them. Yes, I love eggs! I can eat them every day! I love eggs! I especially like omelets. Now I'm trying to get my three-year-old grandson to eat them! I eat eggs. I like them any way you cook them. I love to eat eggs in any cooked form! I entered the Kind Kids giveaway. I love eating eggs just about any way ya can make 'em! Yes, I do like eggs. I do like to eat eggs, especially fried eggs with bacon and bacon, egg and cheese burritos! I love to eat eggs. I like to eat eggs very much.